I'll never look at a traditional Scotch tape dispenser the same way again after seeing this cool new Hallmark Star Wars Downed AT-AT Tape Dispenser. Just when you think the Star Wars merchandising department has run out of product ideas, along comes this hilarious tape dispenser modeled after a downed Imperial Walker AKA an AT-AT. 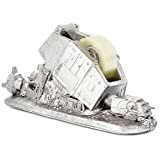 This highly detailed resin tape dispenser looks as if an AT-AT has just been tripped with a harpoon and tow cable from a Rebel Alliance SnowSpeeder during a raging battle on the snow planet of Hoth, except it's much smaller and has a tape dispenser on its back. Makes a fun gift for any Star Wars fan stuck in a boring office.